How Much Does it Cost to Operate a Crusher? Stedman’s Grand-Slam™ Secondary HSI, Horizontal Shaft Impactor, now features two new product developments, a new grinding path and apron adjustment system. This impactor series uses high-chrome metallurgy to significantly increase the wear life of machine components, reducing metal replacement costs. Used for a wide variety of applications, this industrial impactor processes aluminum dross and brick, clay, shale, grog, refractory brick, ceramics, floor tile, glass, bakery waste and scrap carbide recycling. Grand-Slam™ impactor reduces material size more efficiently with maximum up time. 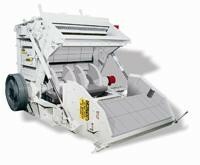 The Crush-Plus™ Grinding Path System creates a third crushing chamber to maximize one-pass product yield, minimize oversize, improve material soundness and produces highly cubical product. The Max-Yield™ Automated Apron Adjustment System maintains gap setting adjustment for aprons and the grinding path. PLC controlled Max-Yield™ improves one-pass product yield and reduces product changeover downtime. For more information or testing procedures contact us. View as a PDF file.